When Autumn comes around, everything seems to be ‘pumpkin-spiced’. There’s not one main-stream coffee shop without some sort of seasonal spiced drink or cake, but when they’re laden with artificial ingredients and refined sugar, they don’t provide us with any of the nutrients we need for feeling our best through the season…. Autumn and Winter are traditionally ‘flu season’, so it’s even more important that we look for nourishing ingredients in our foods at this time of year. Sugar is a hidden ingredient in so many of our store-bought foods and drinks, and it is abundant in virtually all of these seasonal treats…. While it may make things taste great, refined sugar contains chemicals that actually lower our immune system, making us more susceptible to colds and flu. Added sugars such as fructose and corn syrup contain absolutely no essential nutrients, and too much fructose from processed foods causes an overload in the liver – a common cause of non-alcoholic fatty liver disease – now a common disease in the West. There are a ton of reasons to quit sugar, click here to find out more…. 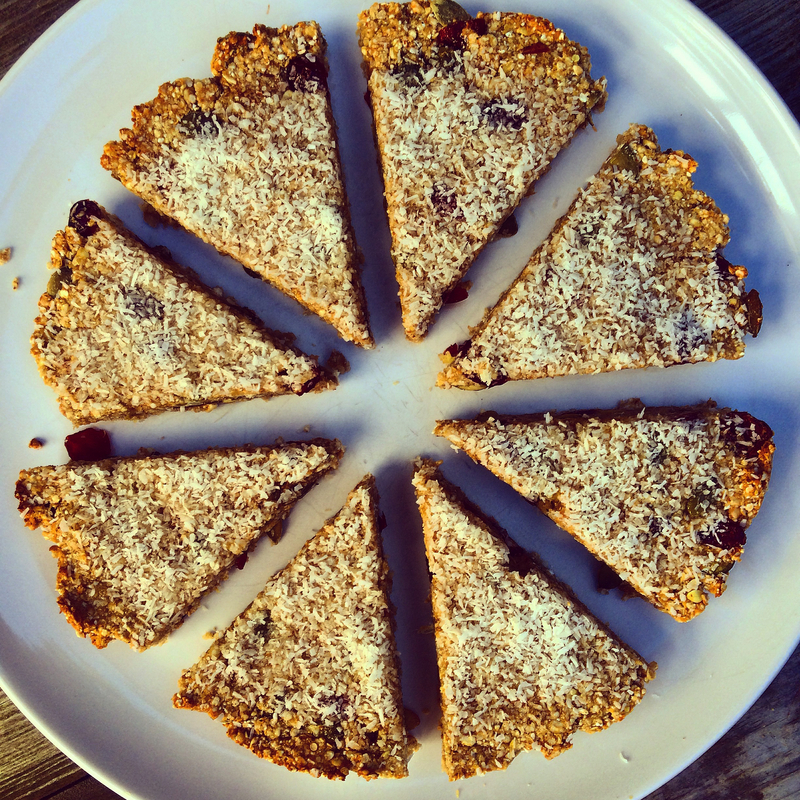 So, if you want to keep your body and mind healthy and happy, and your immune system strong this season – while still getting your hit of pumpkin-spiced goodness – try making these naturally sweet, filling & satisfying pumpkin – spiced ‘latte’ flapjacks. The ‘latte’ part comes from the topping of coconut, which replaces the milk or cream you might find in your coffee shop drink! *If you don’t have buckwheat or quinoa flakes, you can use oats instead, and make this a 100% oat flapjack. 2 Tbsp organic apple sauce *If you don’t have apple sauce, grate an apple and use this instead, or add an extra spoon of honey. Place your ground buckwheat in to a large bowl, and add the quinoa flakes, oats, salt and spice mix. Mix all of these ingredients together. Add your wet ingredients of honey, vanilla extract and apple sauce and stir well. Next, add your pumpkin seeds and dried fruit and mix well until everything is combined. (If your mixture seems quite dry, add a little water until it mixes in to a batter). Line a round, 6-inch cake tin with baking paper and place in the oven for 15-20 minutes, or until the edges begin to brown. When your flapjack is cooled, take it out of the tin and pour on your last spoon of honey, spreading it evenly on top. Sprinkle over your coconut flakes, and then leave in the fridge for about an hour to set. Once set, you can cut it in to pieces to share…. Although one big pumpkin-spiced flapjack all to yourself can seem very inviting if it’s been a long day…. Keep your body healthy, your mind happy, and your immune system strong by swapping processed, sugary snacks for natural, handmade treats!